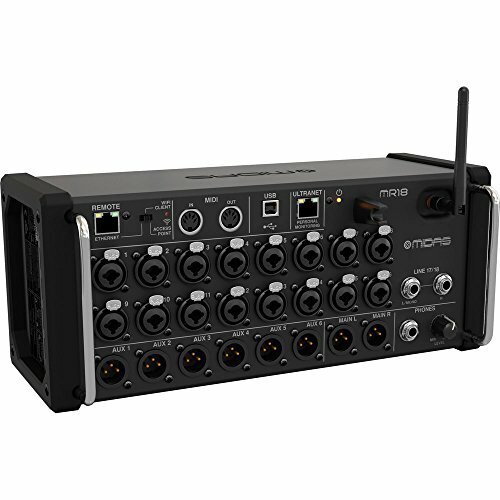 The MR18 from Midas is an 18-input, portable, rackmountable mixer for iPad and Android tablets. It can be used for both live and studio environments in applications for live stage, theater, houses of worship, rehearsals, and more. It features sixteen Midas mic preamps and an integrated Wi-Fi module for wireless control, giving you the ability to move around and manipulate all parameters of your mix. Furthermore, it has USB connectivity for file storage and future system updates. The built-in 18 x 18 channel, bidirectional USB interface makes the MR18 a powerful digital mixing solution for recording directly to your iPad or Windows computer. You can then dial-in a monitoring mix with effects and zero latency while sending your stereo mix and the keyboard player's MIDI notes to your DAW for recording.